“The core propositions of non-traditional reactor proponents – improved economics, proliferation resistance, safety margins, and waste management – should be re-evaluated. The metrics used to support the waste management claims – i.e. reduced actinide mass and total radiotoxicity beyond 300 years – are insufficient to critically assess the short- and long-term safety, economics, and proliferation resistance of the proposed fuel cycles. 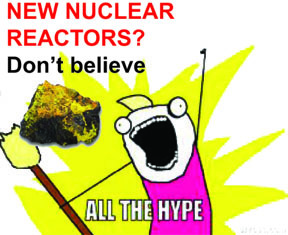 “Furthermore, the promised (albeit irrelevant) actinide reductions are only attainable given exceptional technological requirements, including commercial-scale spent fuel treatment, reprocessing, and conditioning facilities. These will create low- and intermediate-level waste streams destined for geologic disposal, in addition to the intrinsic high-level fission product waste that will also require conditioning and disposal. “Issues of spent fuel management (beyond temporary storage in cooling pools, aka “wet storage”) fall outside the scope of the NRC’s reactor design certification process, which is regularly denounced by nuclear advocates as narrowly applicable to light water reactor technology and insufficiently responsive to new reactor designs. Nevertheless, new reactor licensing is contingent on broader policies, including the Nuclear Waste Policy Act and the Continued Storage Rule. Those policies are based on the results of radionuclide dispersion models described in environmental impact statements. But the fuel and barrier degradation mechanisms tested in these models were specific to oxide-based spent fuels, which are inert, compared to the compounds that non-traditional reactors will discharge. “The Continued Storage Rule explicitly excludes most non-oxide fuels, including those from sodium-cooled fast reactors, from the environmental impact statement. Clearly, storage and disposal of non-oxide commercial fuels should require updated assessments and adjudication. “Finally, treatment of spent fuels from non-traditional reactors, which by Energy Department precedent is only feasible through their respective (re)processing technologies, raises concerns over proliferation and fissile material diversion. Pyroprocessing and fluoride volatility-reductive extraction systems optimized for spent fuel treatment can – through minor changes to the chemical conditions – also extract plutonium (or uranium 233 bred from thorium). Separation from lethal fission products would eliminate the radiological barriers protecting the fuel from intruders seeking to obtain and purify fissile material. Accordingly, cost and risk assessments of predisposal spent fuel treatments must also account for proliferation safeguards. “Radioactive waste cannot be “burned”; fission of actinides, the source of nuclear heat, inevitably generates fission products. Since some of these will be radiotoxic for thousands of years, these high-level wastes should be disposed of in stable waste forms and geologic repositories. But the waste estimates propagated by nuclear advocates account only for the bare mass of fission products, rather than that of the conditioned waste form and associated repository requirements. “These estimates further assume that the efficiency of actinide fission will surge, but this actually relies on several rounds of recycling using immature reprocessing technologies. The low- and intermediate-level wastes that will be generated by these activities will also be destined for geologic disposal but have been neglected in the waste estimates. More important, reprocessing remains a security liability of dubious economic benefit, so the apparent need to adopt these technologies simply to prepare non-traditional spent fuels for storage and disposal is a major disadvantage relative to light water reactors. Theoretical burnups for fast and molten salt reactors are too low to justify the inflated back-end costs and risks, the latter of which may include a commercial path to proliferation.